This course can be taken on its own or as part of the ECPR training tracks. 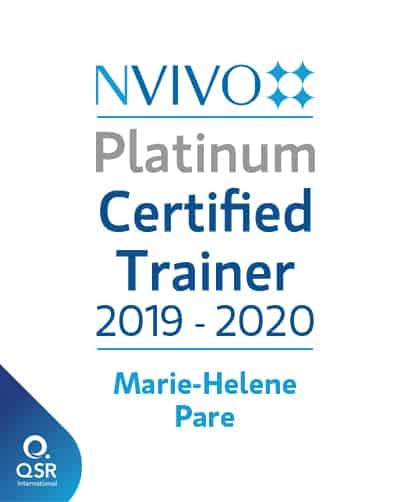 This short course gives an insight into NVivo’s potential for managing, coding, analysing and visualising qualitative data. Course content is spread over four modules and includes topics such as the following: setting up a project; organising data; preparing text and multimedia sources; managing a literature review; coding and analysing data; seeking patterns and identifying relationships; and presenting findings with visualisations. As this is a crash course, only key features of NVivo 12 are taught. The course is entirely hands-on and uses sample data so that participants can practise using NVivo’s basic and advanced functionalities. No time is allocated to working on your own data in class; however, the day’s assignment focuses on working in NVivo using your own data. Note that this course does not cover the foundations of qualitative analysis (for this kind of course, see Qualitative Data Analysis: Concepts and Procedures offered at the ECPR Summer School at the Central European University) or methods to analyse qualitative data in NVivo, such as thematic analysis, grounded theory, etc. (for this kind of course, see Advanced Qualitative Data Analysis offered at the ECPR Winter School in Bamberg). 22-23 February 2019 (10.5 hours over two days). This course is offered at the University of Bamberg (Bamberg, Germany) as part of the ECPR Winter School 2019. Register in the ECPR website. This course can be taken as part of the ECPR training tracks. For further information, see the ECPR website. Chapter 1: Perspectives: Qualitative computing and NVivo. Chapter 2: Starting out, with a view ahead.